Hanging on is a good place to start, but it’s only a first step–a primitive defense mechanism designed to let you get your bearings. It’s not meant to provide permanent salvation for your career. The tough part is that hanging on feels safe and seems sensible; loosening that ironclad grip can seem like a dangerous, and even foolhardy, risk. The delivery and consumption of health care have become a complex dance among payers, providers and consumers, punctuated by choice points and difficult decisions. Nurses now provide the critical link among these entities to ensure high-quality, cost-effective care. Consumers have radically changed the way they interact with the health care industry; this change is now leading to dramatic innovations in the health care professional’s career path. But radical change is replete with opportunities for nurses who are goal-oriented and entrepreneurial and who wish to enjoy dynamic and lasting health care careers. Instead of advancing by finding job openings posted through the human resources department, nurses must proactively manage their careers and grab the opportunities that emerge from change to create self-defined fulfilling career paths. Nursing has exploded with countless possibilities for the clinician, the case manager, the academician, the executive, and most notably, the entrepreneur. Loss is not isolated to organizations; it’s also the biggest hurdle for individuals. I routinely see nurses who are so overwhelmed by change and the attendant losses that they are paralyzed– stuck in anger, fear, denial, or depression. You need to recognize your losses so that you can avoid becoming a victim and get to the other side of pain, disappointment, frustration and anger. For example, you may lose your identity as your job responsibilities change or your workplace is modified. This loss is particularly evident when an organization undergoes a major structural overhaul that results in new job descriptions and titles, realignment of departments, or significant changes in leadership. You may also lose your sense of belonging if the configuration of your work team changes substantially and the systems and protocols undergo radical transformation. The loss can be compounded if other staff members are excited and happy about changes that you dislike. One of the most devastating experiences in the workplace is a loss of meaning. For example, a senior executive worked in a large, regional, nonprofit hospital system that recently changed leadership. The organization was subject to relentless pressure to improve the bottom line. Fiscally, the organization had already been performing well, but in the process, the longtime commitment to community programming, wellness, and rural outreach eroded dramatically. Suddenly, the executive felt that all the long hours, the evening meetings, and the effort were for nothing. Her passion for her work plummeted. Additionally, work losses can stir up other unresolved grief, creating feelings disproportionate to the actual event. If you don’t resolve the loss, your productivity and satisfaction levels will likely wane, leading to a very destructive performance cycle: you stop “going the extra mile,” and suddenly you receive a performance appraisal indicating that your attitude is poor. In fact, you are simply grieving your changed relationship with the organization. Look reality in the eye. If your organization hasn’t changed yet, it will soon. Be prepared for a changing work world that is more entrepreneurial. You can actually influence and control some elements of it by participating: serve on committees, volunteer to be part of a pilot project, and seek ways to get involved. Deal with your grief. Objectively acknowledge where you are in the grieving process, and take active steps to work through it. Stick to your principles, not your position. Change is going to happen with or without you, so be open to a world of possibilities and create your own future. Hold fast to your principles. Don’t be a victim. Even if you are not actively resisting the changes in your organization, simply doing nothing is not in your best interest. Victims abdicate responsibility, allowing life to happen to them. Victors determine their goals and then figure out how to achieve them. Most victors start by taking small, manageable steps. Embrace fear. Undertaking anything new evokes fear. A fear-free life is a life devoid of passion–without risk, color, or imagination. Learn to recognize, cope with, and embrace fear because the more frequently you move through it, the less control it has over you. Conquering fear increases your self-esteem, confidence, and competence. Make room for tension. Tension exists when there is a gap between the current reality and the desired one. It’s part of risk taking and an element of the creative process; tension helps clarify goals and motivates us to achieve them. Spend energy learning how to deal with tension. Become a matchmaker. Do an honest self-appraisal, identifying your strengths and areas that need improving. Then evaluate the organization to see what needs to be done. Match your abilities, desires, temperament, and resources to work. Think creatively, and you can carve a niche for yourself. Let go and let loose. Examine areas of your life that are constricted by old attitudes and that have outlived their usefulness. Are you holding on to assumptions about how life has to be? Have you defined yourself in a narrow sense that keeps you from exploring a passion? Are your goals and dreams gathering dust because you don’t give yourself permission to pursue them? Now is the perfect time to reevaluate your personal mission and desires and bring them to life. Pick a path, any path. This is a time to decide whether, and how, you want to recommit to nursing. Take the time to consider your many options and make a conscious choice about how and where you wish to spend your energy. You can enhance your employability by getting additional credentials or re-certification in an area of interest. There are so many more venues for nurses than existed even five years ago; don’t assume that your career options are limited to what you know. New doors are opening regularly for nurses. Network, read professional journals, get involved in a local chapter of a professional organization to keep your finger on the pulse of nursing today. Once you’ve gathered information, you can begin a decision-making process that will lead to a personally fulfilling choice. Remember to listen to your heart; only you can discern what’s best for you. Bridges W. Managing transitions: making the most of change. Reading (MA): Addison-Wesley; 1991. Bridges W. Surviving corporate transition. Mill Valley (CA): William Bridges & Assoc. ; 1993. 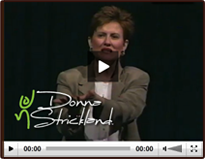 Donna Strickland is a full-time national speaker and organizational development consultant. O. C. O’Connell is a freelance writer and editor and former vice president of corporate communications for a health care consulting firm. This entry was posted by Donna Strickland in Articles, Free Resources. Bookmark the permalink. Follow comments with the RSS feed for this post. Post a comment or leave a trackback.